Where to Stay: From international hotel chains to wonderful Bed and Breakfast establishments: places to stay throughout Newfoundland. The official Government of Newfoundland and Labrador Tourism Guide. What to Do: Festivals, events, art galleries and museums, national historic sites and parks, nature trails and wildlife—there’s lots to do while you are here. The official Government of Newfoundland and Labrador Tourism Guide. Destination St. John's: Everything you need to know and find out about enjoying a visit to the St. John’s and the eastern Newfoundland region. Find accommodations, check out the events calendar, look for a special tour, and get other helpful information. 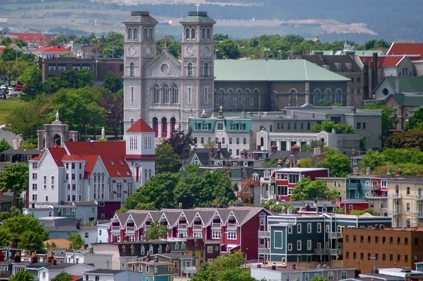 City of St. John's: City information including tourism information such as accommodations, restaurants, events, attractions, arts, events, maps, etc. Newfoundland and Labrador Athletic Association: The official site for running activities in Newfoundland and Labrador listing clubs, events, event results, local rankings and other useful runner information. NL Running: Lots of information about running and triathlon activities in Newfoundland and Labrador and beyond! Historic Sites Association: Links to the many historic sites and related cultural organizations, including Cape Spear and Signal Hill National Historic Sites.